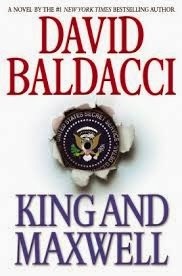 King and Maxwell by David Baldacci is a Grand Central Publication released in November 2013. I received a copy of this book from the publisher and Netgalley in exchange for an honest review. In this sixth installment of the King and Maxwell series, we start off with Sean and Michelle coping with Michelle's near death experience and the physical and emotional scars left behind. As they are about to make plans to take a vacation, they find themselves in yet another murky situation they pretty much just stumbled upon. Tyler is a teenage boy who has just learned his father was killed in action in Afghanistan. He is left behind with a step mother that isn't the warmest person in the world. The other issue Tyler is dealing with is an email from his father sent AFTER his father was allegedly killed. Sam, Tyler's father, accepted a mission in Afghanistan. Things didn't exactly go as planned and now Sam is being hunted by his own country. Tyler has asked King and Maxwell for help. But, there are people that do not want them involved and make that crystal clear, not only to Sean and Michelle, but to Tyler and a few other people that became involved, including the unlikely source of Sean's seldom discussed ex-wife. After years of reading The Camel Club series, I started reading the King and Maxwell series too. The first book in the series left me a little underwhelmed, I must admit. However, I didn't want to dismiss the series out of hand. After reading a few more King and Maxwell novels I have been thankful I stuck with it. This plot was very detailed. Greed and revenge motivated the operation that snared Sam into a plot he patriotically accepted, that was anything but. Baldacci provided an emotional story about a strong father/son relationship and opened new doors in the relationship between Sean and Michelle, which could prove very interesting in the future. Overall a satisfying addition to the series. This one is an A.